Best Chili Recipe for Hot Dogs, is slow cooked in an oven with savory spices the way you remember Old Fashioned Hot Dogs were served at Hot Dog stands and State Fairs. This tasty and easy homemade Recipe comes from a former Carolina Beach, North Carolina vendor, who had to get it right! I think you will agree he did. The first Chili Recipe makes a large amount of to feed a crowd of family and friends. It will make a welcomed, delicious dish for your social events. Even picnics. Divide Chili into several small containers to be used in the suggested dishes listed below. Place them in the freezer and thaw as needed. The last recipe, Quick Chili Recipe, makes a smaller amount of chili. The first recipe is an Old Fashioned Recipe with a fine texture and deep flavor by the addition of special spices and slow cooking. The second recipe makes a Quick Chili Recipe in a smaller amount that is coarser textured. Mix all ingredients in a large Dutch Oven, or similar type baking pan with a lid. Cover and cook in a 350 F oven for 3 hours. Check every 30 minutes or so, after the first hour to see if it seems to need more water added to keep it from getting too dry. Also, to keep it from sticking to the pot. However, unless a lot of steam escapes from around the lid, you should not need to add more liquid. Cook it to the thickness of a commercial chili. Please note folks have reported excellent results cooking this chili in a slow cooker. I have not cooked this in a slow cooker myself so can't give you exact temperatures and times. However, check your cooker instructions for temps and times, considering this chili is cooked to a fine texture just like chili served in a fine restaurants. This recipe makes enough to feed a crowd. If you need smaller amounts, divide the recipe in half or fourths. To save time and money, make up the the full batch even when you only need a small amount. Then freeze what you don't use immediately, in several freezer containers to use at a moments notice. Place ground beef is a medium size sauce pan on top of stove. Break up hamburger meat with a fork and add onion and salt. Turn on medium heat and cook while stirring until meat has lost it's pink color and starts to brown slightly. Add rest of ingredients, except Liquid Smoke, and stir well. Cover and cook about 30-40 minutes until chili is thickened to your preference, stirring occasionally to prevent sticking. When done, remove from heat and stir in Liquid Smoke until well blended. 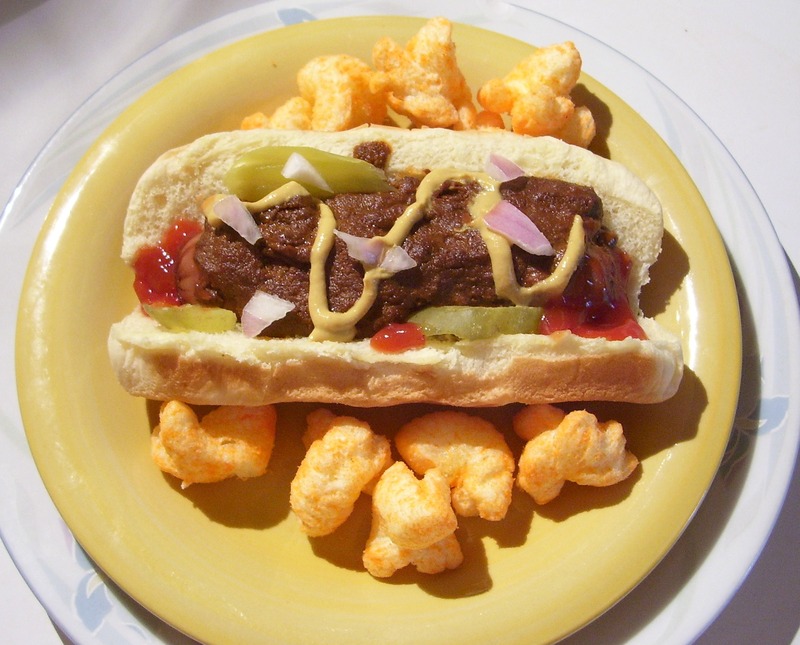 Serve with a wiener on a bun and add other favorite condiments, such as Coleslaw, mustard, ketchup, pickle relish, dill pickles. green olives and onions. Some folks like to add sauerkraut instead of cabbage slaw. Add a little of your favorite Barbecue Sauce to a cup of chili, heat and serve with a hamburger on a bun. Serve in a taco shell with lettuce, cheese, tomatoes, taco sauce, etc. or in a taco salad. A real treat with Homemade Corn Tortillas. Spice up a pot of vegetable soup with 2-4 cups chili.